This bra is dedicated to my friend Kat and her love of leopard print 🙂 or lack thereof! Which looks a lot like a bra that I own from this British bra company – Miss Mandalay. This three piece cup seems to be their standard bra design. Well, what can I say about the construction? This is also first time I have made a bra from lycra. Let me tell you, I was sceptical to begin with and I am still sceptical after I have finished!! I like a rigid cup and bridge, especially if you are making a bra for bigger cups. I certainly do not like the idea of applying interfacing to strengthen my bridge piece. NONE of my RTW bra’s have ever featured that so why should home made bras differ so much from your RTW bras? 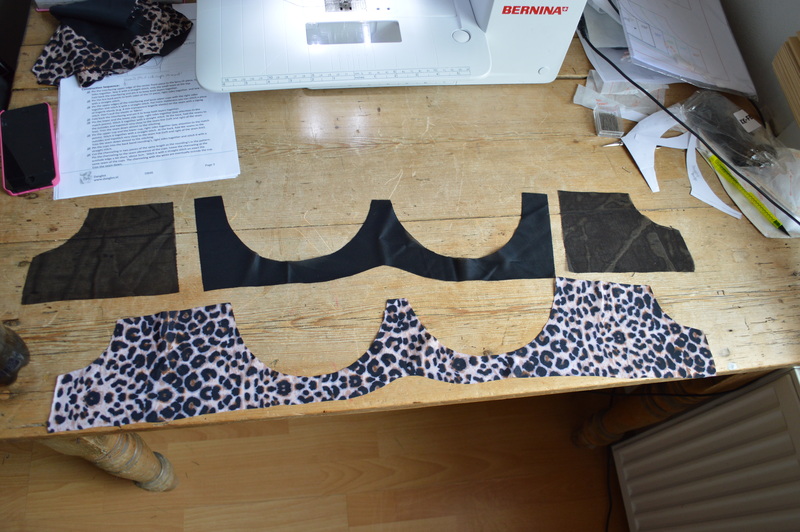 I liked the idea of an all over leopard print bra, so I had a layer of powernet and rigid tricot on the inside with a layer of leopard print lycra on the outside. I also did my usual bridge alteration, modified to fit me. Unfortunately, it’s hard to really know how a bra fits until it’s fully made up. So whilst I am loving the all over leopard print look, the band is unfortunately a bit too tight and I think the cups are flattening the breasts slightly. This is most probably due to me making the bra more rigid when it has been designed specifically with stretch fabrics in mind. You can seen more clearly from the back view that the band is a bit too tight here. I definitely could have been neater but I knew this would be a tester bra so my seams are exposed. As it is a double layer cup, next time I will make more of an effort to enclose those seams to prettify up the interior. I will also change the elastic straps, I prefer something more firmer than just elastic for straps. I thought about adding a hot pink ribbon to the front but actually I like the plain leopard print with black look just as much. Anyway, I’m completely sold on the leopard print now and am thinking of making matching knickers, a slip and a bra. Seriously a girl can never have enough leopard print, right? Love the leopard print! Gotta have more than one, y’know! Ha ha yes you do!! Thank you! 2)the Beverly Johnson Bramakers supply (Canada) Shelly bra pattern? They both have deeper cups and are designed for a more stable cup fabric. I have also fused lightweight lycra directly to sheer stabilizer to create pretty, stable cup fabric with a little give and still use fun prints! Have you also tried cloning your RTW bras? i have done that with success also.Thanks so much for sharing your experience with bra sewing! Thanks for your lovely comment! And thanks for the two different bra suggestions – I’ve never heard of Bravo Bella so I will have a look at that. I already have a Beverley Johnson Classic Pin Up girls bra which I will try soon but if that goes well I may try the Shelly too! Although I find her patterns to be the most expensive to be honest. However, I’ve just finished an Elan 645 which I will blog about next week though and that went pretty well. As with cloning bra’s, I think it is a great idea and I did start doing one a couple of years ago and then lost interest. I have it in a little bag in pieces somewhere in my sewing room though! I think the Shelly bra has a better shape and support than the Classic – I know the prices are high, but they are excellent patterns. I had zero success with Elan patterns – totally wrong shape for me, I am glad it worked for you! But the bravo Bella is well worth its cost and the kits are very reasonably priced, too. It is really nice when a bra pattern works without a a major re-working. I did the cloning prior to a large weight loss when I could not find any RTW to fit me, not matter the cost. It was a challenge, but very rewarding with excellent results. I even made patterns from a paper surgical tape mold of the breast… and then designed a custom swimsuit pattern, underwires and all. It took 3 tries, but it was the best swimsuit I ever had at any cost. Have fun!